The SB (Squawkbox) program is used to connect a Flight Simulator to the internet. It talks with Microsoft Flight Simulator using the FSUIPC program and the multiplayer features. You need FSUIPC installed so SB can access and modify variables not available in usual multiplayer communications like weather. It uses the multiplayer capabilities to allow FS to show you other players in your area. SB talks to a network of servers that other players also connect to. These servers typically have other players using a program like ProController which allows the players using it to view location of other players and guide them as an ATC (Air Traffic Controller). I have never been able to find documentation to show how to use the many different features of SB so this document attempts to show what I have learned through my many hours of using it. The first thing you see once getting past the splash screen of SB is the message area. You will need to stretch and shrink the display till it appears where and how you would like it. You can type messages and commands into the white area and read the responses in the black area. 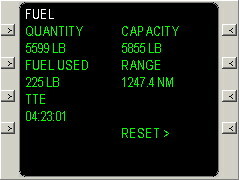 In this example the green text is being sent by another aircraft and the red is what I have sent. I have my Flight Simulator set up to allow the responses to scroll across the top of the FS screen also. You can see here an “IDENT” button. When you are online you can click this button to momentarily allow your aircraft symbol to flash on the ATC’s screen. When they ask you to “IDENT” they want you to click this button. The “F” and “E” buttons bring up the FMS and the TCAS. The TCAS display shown here should be what you see when clicking the “E” button. It shows your direction, wind direction (upper left), air and ground speed (bottom left), course, waypoints, navigation aids, and other aircraft around yours in their relative positions. You can zoom the range in or out by clicking or right clicking in the center of this area. In the upper right is the current time in Zulu (GMT) with your next waypoint and distance to that waypoint. The words along the top are active. They can be clicked to turn different options for this display off or on. CRS causes your course to be displayed. Shown here in purple. WPT causes your way points to be displayed as diamonds. INF causes information to be displayed about nearby navigational aids. The first click shows them, the second click shows their names, a third click shows the time you are expected to arrive at the waypoint (in zulu) and a fourth click turns them off again. RNG causes the ring to be displayed. The numbers around the ring are the directions of the compass. TCAS when on will show yellow and red warnings when an aircraft is getting too close to yours. At times you will even get audible warnings “TCAS Alert!” but I haven’t quite figured out what sequence of options turns it on but it can be turned off by clicking the letters TCAS. CTR causes the aircraft symbol to be centered in the ring. Otherwise the aircraft is shown near the bottom of the display and only a portion of the ring is displayed. NAV (grayed out here) when clicked show symbols for nearby VOR and NDB stations. Another click on this and the navigation names will appear. A third click will cause their frequencies to appear. A fourth click turns them off again. The FMS is the meat of SB. Some would disagree and say SB is mostly used to communicate with other players. In my mind Roger Wilco has taken over the role of communication in these days of broadband. There are lots of buttons by and around the main FMS display as shown here. The colored buttons on the top are duplicated on the side. There is a little unlabeled button to the right of the “EXIT” button. This shrinks the FMS to just the text display and it’s surrounding buttons. If all your important buttons disappear press that unlabeled button again to bring them back. Once again you need to stretch and shrink the window to move it to the proper position and size. SB will remember all of the window information so you only have to go through the stretch and shrink till you find a favorite setup. The letter and number pads are used to enter information. The information appears at the bottom of the text screen until you hit the button to use it. This display here is the NAV display. It shows the next 4 waypoints, the direction to each waypoint from your current position and the distance along the flight path to that waypoint. If you pass the top waypoint and are on your way to the second one you may notice that the distance keeps getting farther. That is because SB is computing the distance as if you were flying back to the top waypoint then on to the 2nd waypoint. You have to manually delete the top waypoint in the WAY screen for this screen to show properly. You see here an FL listed. My flight plan includes flight levels so they show up here. If I was approaching a point in a STAR the flight levels would be different. Most of the time you can scroll down the waypoints by clicking the NEXT button. A/P button connects this FMS to your autopilot. SB will program your autopilot to take you to each succeeding waypoint and remove the waypoints from the list as they are passed. Personally I see very few reasons to have to use this feature. VATSIM, the service I use, discourages you from logging on and leaving the computer for extended periods of time. The reason I use Squawkbox is to fly an aircraft in Flight Simulator 2002. I don't use SB to watch it fly the plane for me. If I was on a "Cross the Pond" flight and needed to visit that little room just outside the cockpit or go to the galley to get some nourishment I will make limited use of this feature. POS shows a display of the coordinates of where you are along with direction and speed. This comes in handy when trying to find a non-unique nearby intersection. If you try to use the DIR-TO intersection and it lists 2-4 different possibilities you need to know which one is closer to you. 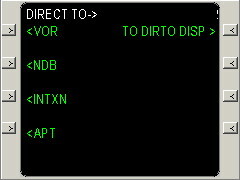 RTE allows you to manually program the flight plan. You enter the starting point and destination. I never use this because I download my flight plans from www.simatc.com or create them using FSBuild. Click the DIR. TO button and you get this display. It wants you to key in a navigation aid. If you have already used this once during this session you can return to your previously selected display by pressing the little arrow button next to “TO DIRTO DISP”. Use the letter and number buttons to key in a navigation aid and click the appropriate arrow button. 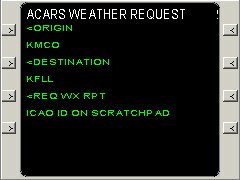 Want to find a specific airport like Orlando International then hit the KMCO buttons, KMCO will appear at the bottom below APT. Press the arrow button next to the APT and you will have directions to Orlando International. Want to find out about the Vero Beach FL VOR key VRB and press the arrow button next to VOR. 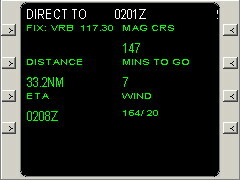 This shows the information for the Vero Beach VOR. Upper left shows the frequency of the VOR. You can tune your nav radio to that frequency to get a fix on it. Upper right shows the magnetic direction you have to fly to get there. Below the frequency is the distance in nautical miles. Assuming you were to continue your current speed it shows you the minutes it will take to get there. Finally it shows the time you will be there in GMT/Zulu and the current wind direction and speed. Waypoints are points in your scheduled flight path. The list of waypoints can be moved up and down past the “Current Fix” by pressing the PREV and NEXT buttons. Once you pass a waypoint this display must be used to remove that waypoint from the list. 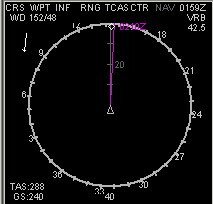 If ATC tells you to expect vectors to an intersection or VOR then proceed from there you can use this display to add that to your list of waypoints. If your flight plan doesn’t have any STAR waypoints and you have charts showing them you can add the STAR’s waypoints to your flight plan. If your flight plan has you going to LON instead of LOZ on your approach to KSDF you can easily correct it by deleting the LON waypoint and adding the LOZ. If ATC tells you that you can proceed to a waypoint down the STAR you can delete each entry before that waypoint. INSRT WPT – Allows you to insert a waypoint after the “Current Fix”. Entry is similar to DIR TO entry. Press the arrow button next to INSRT WPT. 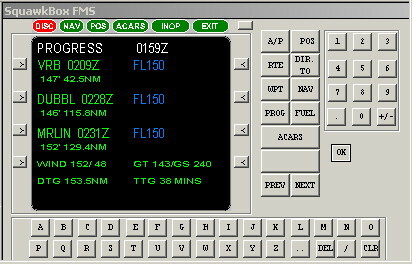 Using the letter and number buttons to key in a waypoint navigation aid or intersection and press the appropriate arrow button. DEL WPT – Press this arrow button to delete the “current fix” from the list. DEL ALL WPTS – Careful you don’t press this by accident. It removes all the waypoints in the list. The FUEL display gives you a digital readout of how much fuel you have, how much your tanks could hold, how much you have used since starting SB, how far you can go in miles (assuming current speed) and time (assuming constant usage). You can press the arrow button next to RESET to clear the “Fuel Used” quantity. 061853Z – Time of report, the 6th at 18:53 Zulu. 30016G23KT – Winds to the NW at 300 degrees at 16 knots gusting to 23 knots. Most reports don’t have the gusts and some times you may see vrb for variable. This is the one part I use the most when at an uncontrolled airport. You need to know which runway to use to take off or land into the wind. For this instance I would select the runway closest to a runway 30. 10SM – Ten statute miles visibility. This can be useless if OVC005 because you would have to get down below 500 ft to see 10 miles. SCT023 – Scattered clouds at 2300 ft. There may be several cloud layers mentioned like here. Clouds can also be BKN (Broken) OVC (Overcast) FEW (Few) SKC or CLR (clear). CLR is reported by an automated system and is clear below 12,000ft. SKC is reported on a manual report. RMK – Remarks. Some more common ones are Sea Level Pressure SLP in hectopascals, automated system can’t (A01) or can (A02) discriminate the type of precipitation. Squawkbox is more than just a program to connect your Flight Simulator Multiplayer Session to a network of servers supporting a large group of players. It gives you the tools to load and execute a flight plan. It also gives you the tools to determine the conditions of the environment you are flying in. 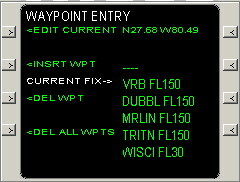 It gives you tools to modify your current flight plan or depart from your flight plan as requested by ATC.